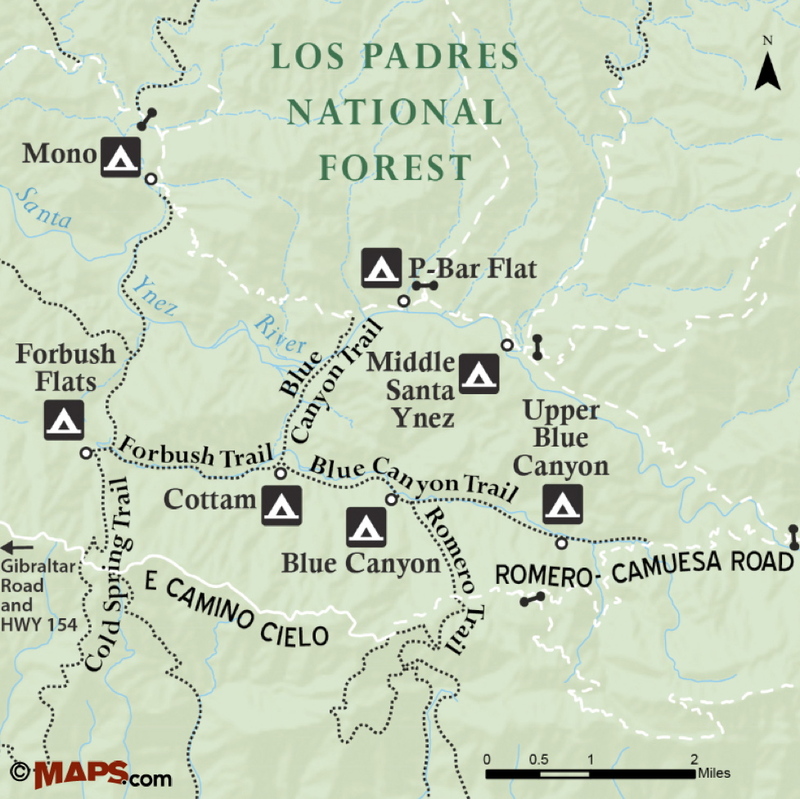 There are four different campgrounds found in the upper Santa Ynez River Recreation Area. Each of them can make for a good base camp from which to explore the different nearby trails. The campground at P-Bar Flat is located near Blue Canyon Trail, which connects to Cottam Camp, and can make for an interesting day hike destination. The hike to Cottam Camp from P-Bar Flat is about 4.5 miles roundtrip, and can include a side visit to an old hunting camp. 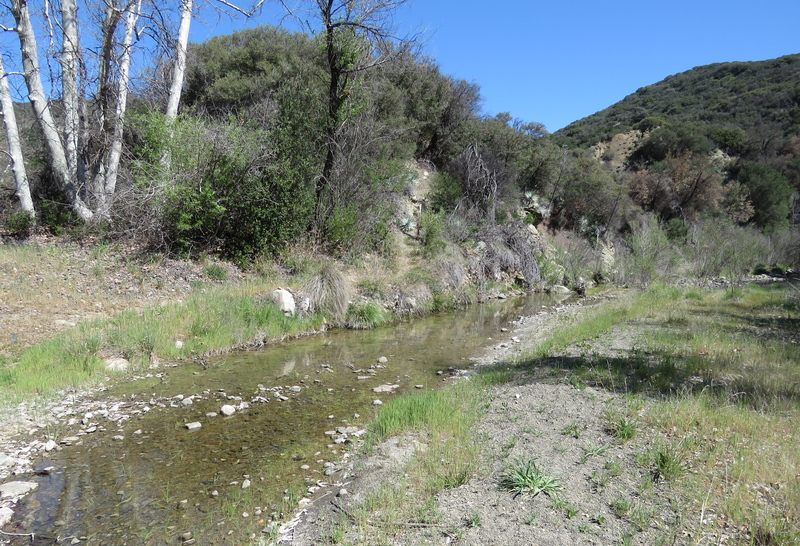 The trail is mostly level and follows the Santa Ynez River and Blue Canyon Creek, both of which are currently flowing intermittently. 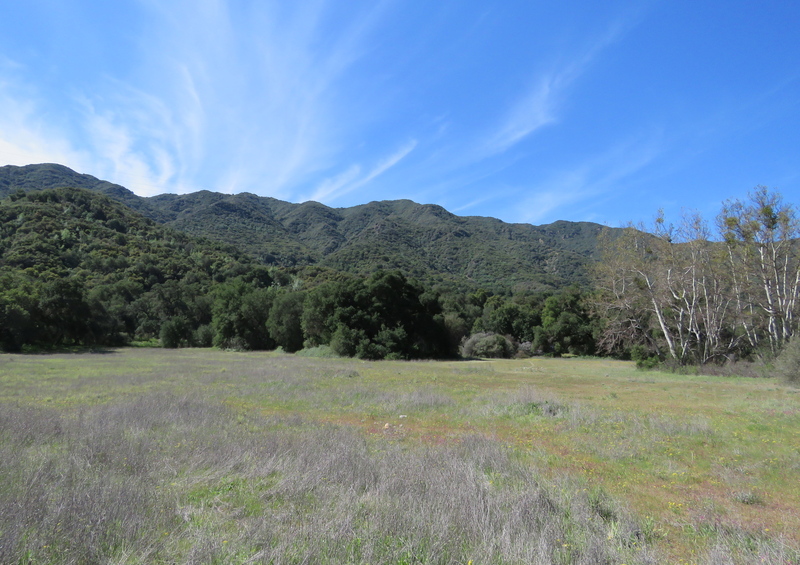 To get to the upper Santa Ynez River Recreation Area from Santa Barbara, find your way to Gibraltar Road in the foothills behind Santa Barbara. Follow Gibraltar Road to the top of the Santa Ynez Mountains, where it meets East Camino Cielo Road, and turn right on to East Camino Cielo. Currently, Gibraltar Road is closed for repairs until May 22nd. However, East Camino Cielo can also be reached from State Route 154. It is a longer route, but does provide access until Gibraltar Road reopens. Continue east along East Camino Cielo, along the top of the mountains. The road eventually arrives at Romero Saddle, where it changes names, becoming Romero-Camuesa Road, and then continues, unpaved, down the backside of the mountains to the Santa Ynez River. The road crosses the river, and continues on towards the intersection with Big Caliente Road. From there, continue straight, past Middle Santa Ynez Campground, to the next campground, which is P-Bar Flat. There are three different forest service gates along Romero-Camuesa Road that are closed during inclement weather. Current road closures and fire restrictions can be found on the Forest Service website, http://www.fs.usda.gov/lpnf. P-Bar Flat was established as a hunting camp around 1916. The camp takes its name from the chamber pot that is said to have hung from one of the trees and was used for target practice. The original name used more colorful language to describe the pot, but over the years it became known as P_____ Flat, or P-Bar Flat. P-Bar Flat has four campsites located under the oak trees, each with a picnic table and metal fire ring. The campground is located next to Horse Canyon, across from the Santa Ynez River. An adventure pass is required to camp at the campground, but not to park at any of the trailheads. For the hike to Cottam Camp, continue on foot, heading west along Romero-Camuesa Road to Blue Canyon Trail. The trailhead is about a half mile from the P-Bar Flat. Along the way, an interesting side visit can be made to an old hunting camp in Rose Canyon. The canyon is just before Blue Canyon Trail and is the first large canyon along the road past Horse Canyon. There is no real trail through Rose Canyon, but the camp is less than a half mile in. The most direct route is along the creek bed, but occasionally one can find remnants of the trail on the eastern side of the creek. 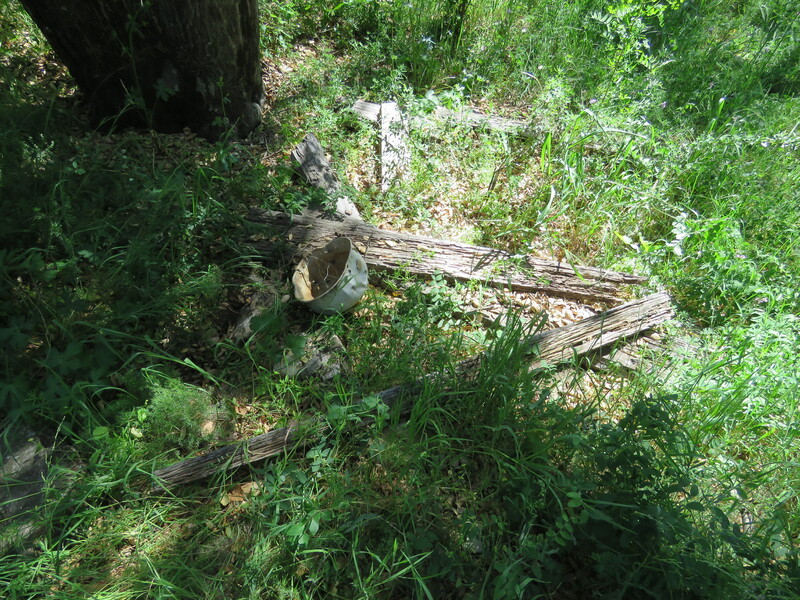 Little remains of the camp, which is also on the eastern side of the creek, but with some perseverance, one can find remnants of the picnic table, as well as an aluminum pot that’s been used for target practice. The camp appears on one old recreation map as Rowe’s Gulch. During the 1920s and 1930s a number of hunting camps were established in the backcountry by families or groups of friends, and so one possibility is that this site was used by the Rowe Family. During the 1930s trails were built to a number of these hunting camps by the Civilian Conservation Corp. However, during the Second War World, the amount of manpower available to maintain trails was reduced, and the forest service closed the forest for part of the year, including during the hunting season, as a fire control measure. As a result, these hunting camps were used less and less, and many of them faded into obscurity. 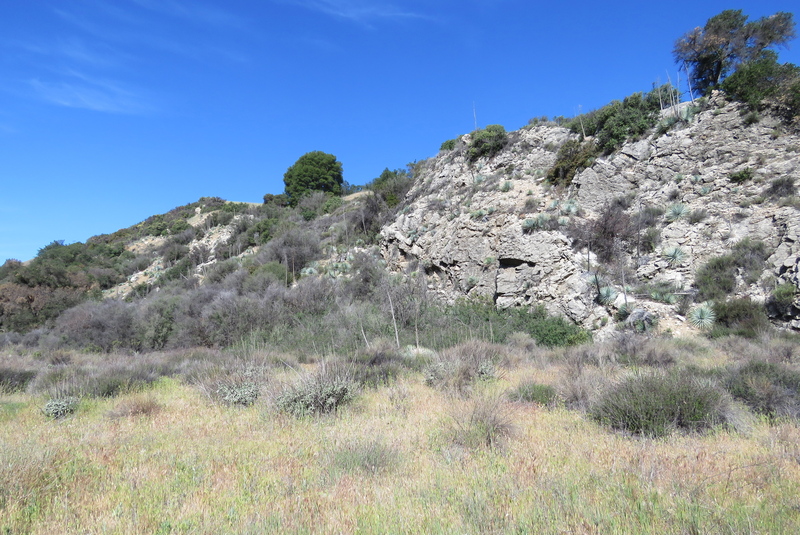 Just past Rose Canyon, along Romero-Camuesa Road, is the beginning of Blue Canyon Trail. The trailhead overlooks the Santa Ynez River, and is marked with a brown carsonite sign. Here, one can also find a small pullout for parking. From the trailhead, Blue Canyon Trial makes it way down to the Santa Ynez River. The trail is a little indistinct as it crosses the river twice, but where you’re aiming for is the broad flood plain on the north side of the river. Here, one can find another carsonite sign marking the trail. The trail passes a large outcropping of sierra blanca limestone, and continues downstream along the flood plain through an oak savannah of wild grasses and coast live oak. 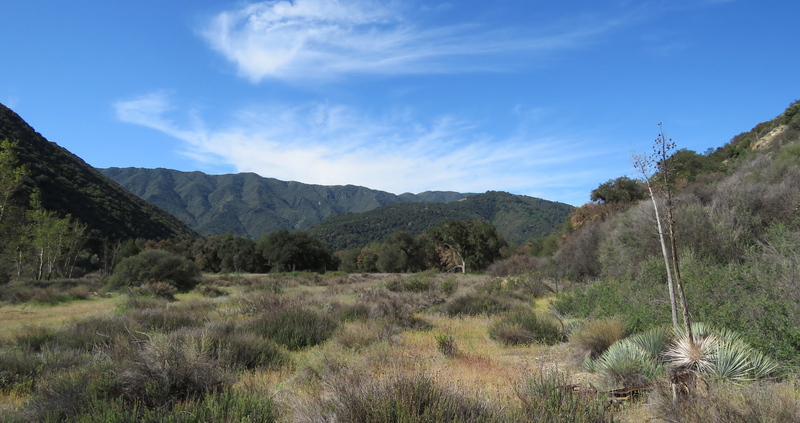 The trail then crosses the Santa Ynez River at more or less a right angle, and continues through more oak savannah before arriving at Blue Canyon Creek. The trail crosses the creek and continues upstream toward Cottam Camp. The trail has one indistinct section where it crosses and travels up the middle of the creek, but then reestablishes itself on the eastern side of the canyon. Blue Canyon Trail then arrives at Cottam Camp, where it meets Forbush Trail. Cottam Camp is located under the oaks and cottonwood at the edge of a large meadow, and features a picnic table and fire ring. Currently there is some water to be found in the creek near the camp. Cottam Camp takes it name from Albert Cottam, who used to have cabin in the area. Albert Cottam was born in 1898, and moved with his family from New Jersey to Montecito when he was eight. When he was 14 years old he was invited by the foreman of Pendola Ranch to stay there for a couple of weeks. At the ranch, the foreman shared with him stories about the local backcountry, as well as tales of meeting Pancho Villa and Joaquin Murietta. And perhaps it was those experiences that inspired Cottam to build a cabin in Blue Canyon a couple years later with his older brother Russell. The two brothers, still in their teens, hired a man to cut alder trees for them in nearby Forbush Canyon, which they used for the cabin’s frame. With the use of pack animals, they brought over the mountains all the boards and fixtures needed to build and furnish the cabin. An experienced horse packer, Cottam brought in visitors to his cabin on the weekends. And when trail crews were working in Don Victor Valley, he would ride over there twice a week to bring the crews fresh supplies and meat, as well as newspapers and their mail. Cottam also worked as a horse packer for his neighbor Roderick Show. Show ran a small guest ranch called Camp Ynez in Forbush Canyon. The camp was about a quarter-mile west of Cottam Camp. Remnants of Camp Ynez can still be found by hiking from Cottam Camp along Forbush Trail. As the trail makes its way up Forbush Canyon, look for the first open clearing along the trail. Here, one can find pieces of corrugated sheet metal, that are said to be part of the barn. 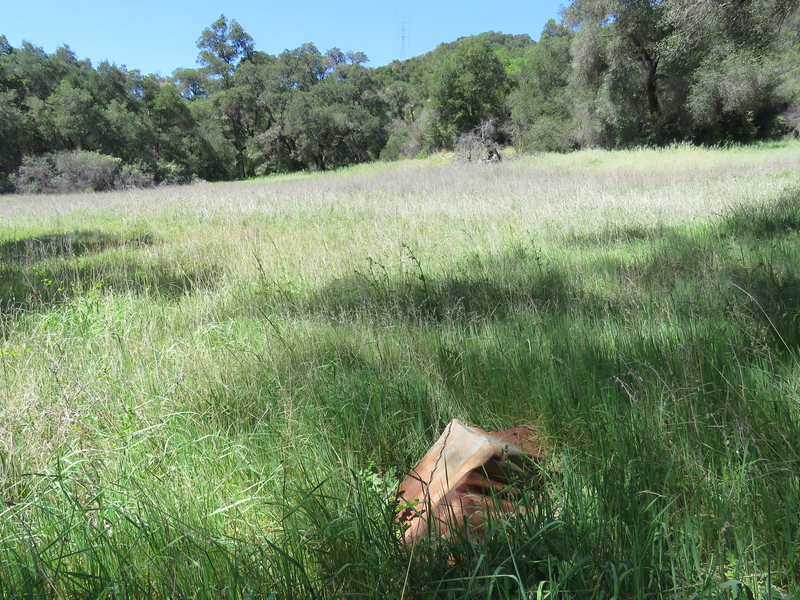 Nearby, between the creek and the trail, hidden amongst the poison oak, one can also find a cement foundation from one of the camp’s structures. Past the site, Forbush Trail continues up towards Forbush Flats, where Cottam’s other neighbor, Frederick Washington Forbush, homesteaded. It was Forbush who built the trail through the canyon that now bears his name. Regardless of how far you hike you’ll have a chance to see some of Santa Barbara’s historic backcountry camps. This article originally appeared in section A of the May 4th, 2015 edition of Santa Barbara News-Press. Yay! 200th article! Thank you for your diligence in documenting our amazing trails for the hikers of today and the future.